By	Allyson Haymaker. Last edited by Marios Alexandrou on November 11, 2018. I never expected to find a time warp on Michigan's western coast. But that's exactly what my husband and I found in Manistee several years ago during its Victorian Sleighbell Parade and Old Christmas Weekend. Imagine street vendors selling roasted chestnuts… the sweet scent of pine boughs… and softly falling snow dusting carolers as they sing. And wait until you see draft horses pulling a sledge down River Street, loaded with a 40-foot-tall upright Christmas tree. It's a very impressive sight! 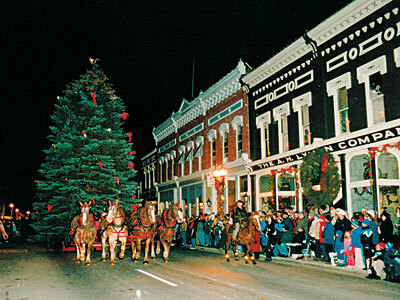 The horses pull the tree from one end of River Street to the other. As it passes by, folks fall in behind it. When the tree reaches its traditional spot in the middle of the street, near the municipal marina, the mayor throws a switch and lights it. It's quite a heartwarming scene. The friendly residents are equally impressive as they don Victorian attire and put on a great show. Their warm smiles reflect the joy in their hearts; they make everyone feel like part of an old-fashioned Victorian family. Located next to the Manistee National Forest, Manistee is a fun place to visit year-round. The town prospered as a lumber boomtown; in the 1880s, the area boasted 34 sawmills. The timber boom created incredible wealth. In fact, at one time, Manistee boasted more millionaires per capita than any other city in America! Manistee still looks much like it did during those lumber baron's heyday. Its entire downtown district is listed on the National Register of Historic Places, and many graceful “painted lady” Victorian homes dot its cozy neighborhoods. The heart of the historic district is River Street, which follows the Manistee River. The street is lined with restored buildings featuring splendid architectural facades and housing cute gift shops, antique stores and restaurants. And a lovely 1-1/2-mile riverwalk leads to Lake Michigan; during summer, it's a great place to watch giant oceangoing tankers pass through town on their way to Lake Michigan. Since our first visit, attending this little slice of holiday enchantment has become an annual family tradition. And every time, we appreciate Manistee more and more. You will, too!